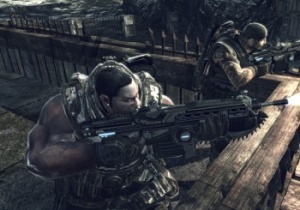 Amazon.com will be offering a life-size Lancer Assault Rifle replica from NECA, available in November with the launch of Gears of War 2. Designed around 3-D data obtained directly from Epic's Gears of War 2, the Lancer replica is a full three feet long and hand-painted in exquisite detail, featuring a removable clip and side handle that both slides and folds. Pulling the trigger activates vibrating action and a dangerous chainsaw sound powered by three "C" batteries. Customers who pre-order this unique collectible will receive a free copy of Gears of Wars 2 standard edition for the Xbox 360, and will be eligible to upgrade to the Limited Collector's Edition for only $10.00 more. NECA will also be releasing a "Headshot" Locust Drone action figure at the same time, complete with metal COG tags. Following up on NECA's original Locust Drone figure, the "Headshot" Drone will be depicted as an unfortunate victim of a Longshot Sniper Rifle blast to the skull. The Lancer assault rifle replica is set for release on November 7, in line with Epic's Gears of War 2, and will retail for $139.99. To slap down the green for your own pre-order (or to just have a look at the thing), go to Amazon.com.